The 38th session of the Intergovernmental Committee on Intellectual Property and Genetic Resources, Traditional Knowledge and Folklore (IGC) is taking place from 10-14 December. The draft programme is here [pdf], and the draft agenda is here [pdf]. This session of the IGC is addressing concomitantly the protection of traditional knowledge (TK), and the protection of traditional cultural expressions (TCEs or folklore), as the committee found that many issues were common to the two subjects. IGC delegates are expected to work from draft articles [pdf] on the protection of TK, and draft articles [pdf] on the protection of TCEs. Those draft articles come from the second revision to earlier drafts of those articles, which was done and agreed on at the last session of the IGC in September (IPW, WIPO, 3 September 2018). 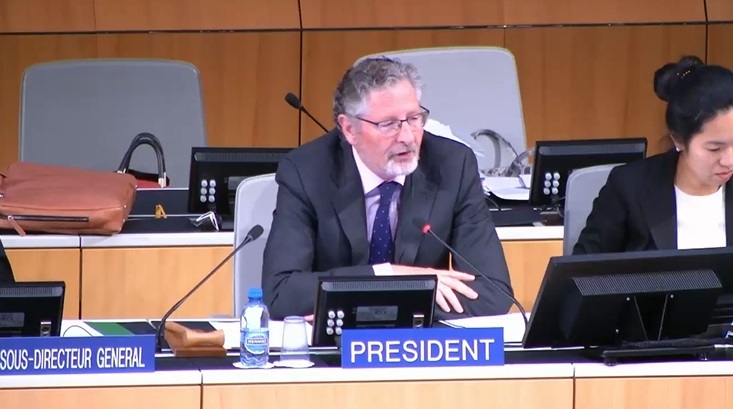 “It will be important that, if the IGC is to make substantive progress on TK and TCEs, Member States agree on a common approach, which will enable the IGC to focus on the detailed operative mechanisms and language, including a measures- and/or rights-based approach,” Goss note said. Indonesia speaking on behalf of the Asia and Pacific Group, Morocco for the African Group, and China (a regional group alone) said the protection of TK and TCEs requires binding instrument(s). Indonesia said most members of the Asia and Pacific Group find that the instrument(s) being developed should benefit indigenous peoples and local communities, but be in accordance with national law in cases where TK and TCEs cannot directly be attributed to a specific group of indigenous peoples or local communities. Morocco for the African Group added that the current international IP regime is not providing sufficient protection for TK and TCEs, and the absence of binding rules has contributed to illegal appropriation, still ongoing. The delegate urged members to advance on the draft articles so that the next WIPO General Assembly can decide on convening a high-level negotiating meeting (diplomatic conference). Canada, for Group B, said although progress was made in the drafting of articles, more work needs to be done, and added that genetic resources, TK, and TCEs should be protected in a manner which supports innovation and creativity, and any instrument developed should take into consideration the unique nature of the three subjects. Discussions should address the broader context, the delegate said, and consider implications of the proposed protection. Native American Rights for the Indigenous Caucus said the IGC must recognise the rights of the indigenous peoples enshrined in the United Nations Declaration [pdf] on the Rights of Indigenous Peoples. The declaration was adopted on 13 September 2007, by a majority of 144 states in favour, 4 votes against (Australia, Canada, New Zealand and the United States) and 11 abstentions (Azerbaijan, Bangladesh, Bhutan, Burundi, Colombia, Georgia, Kenya, Nigeria, Russian Federation, Samoa and Ukraine), according to the UN Department of Economic and Social Affairs website. Customary law should also be recognised by the IGC, the representative said. All groups deplored the depletion of the WIPO Voluntary Fund, which allows for the participation of indigenous peoples to IGC meetings, and called for members to contribute. According to an IGC document, the amount available in the fund as of 20 November was basically under CHF 100 (under US$100). The first donors were the Swedish International Biodiversity Programme, and the government of France, both in 2006. They were followed by the Christensen Fund, Swiss Federal Institute of Intellectual Property, Ministry of Science and Technology in South Africa, Norway, Australia, and New Zealand. Largest contributor so far was the Swiss Federal Institute of Intellectual Property. At the last IGC session, indigenous peoples proposed that the WIPO general budget contribute to the Voluntary Fund, which was supported by some countries, including Brazil and South Africa. This idea is not new, as in 2014, Australia, Finland, the Holy See, New Zealand and Switzerland tabled a proposal [pdf] at the WIPO Programme and Budget committee, which was opposed at that time by the US, Germany, Sweden, and Indonesia. Following the suggestion in the decision [pdf] taken by the WIPO General Assembly in October that ad hoc expert groups be convened prior to some IGC sessions to help member states discuss difficult issues, an expert group on traditional knowledge and traditional cultural expressions met on Sunday 9 December. The list of participants of the expert group is here [pdf]. Such an ad hoc expert group was also called to help the IGC on genetic resources issues prior to the 36th session on the IGC, in June (IPW, WIPO, 27 June 2018). Also for member states’ consideration this week is an update [pdf] of a 2008 draft gap analysis on the existing protection regimes related to TK, produced by the WIPO secretariat. This comes from a decision by the WIPO General Assembly in 2017. The same decision requested an update [pdf] of a 2008 gap analysis on the existing protection regimes related to TCEs, which is for member states consideration this week too. On the table this week is a compilation [pdf] on materials on databases relating to genetic resources and associated traditional knowledge. This compilation, first submitted for the 35th session of the IGC, in March, is resubmitted for this session of the IGC. A similar compilation [pdf] on materials on disclosure regimes relating to genetic resources and associated traditional knowledge is also for discussion this week. A number of previously tabled proposals from member states are still under consideration. Most of those proposals call for the defensive protection of genetic resources and TK. A joint recommendation [pdf] on genetic resources (GRs) and associated TK has been resubmitted by Canada, Japan, Norway, South Korea and the United States. The recommendation calls for measures to prevent the erroneous grant of patents, including opposition measures. Another joint recommendation [pdf] on the use of databases for the defensive protection of GRs and TK associated with GRs is resubmitted by Canada, Japan, South Korea, and the US. Canada, Japan, Norway, South Korea, Russia and the US resubmitted a proposal [pdf] for the terms of reference for the study by the WIPO secretariat on measures related to the avoidance of the erroneous grant of patents and compliance with existing access and benefit-sharing systems. Also resubmitted is a proposal [pdf] for a study by the WIPO secretariat on existing sui generis systems for the protection of TK in WIPO member states, by Japan and the US. The US submitted an updated version of a paper [pdf] entitled, “Identifying Examples of Traditional Knowledge to Stimulate a Discussion of what should be Protectable Subject Matter and what is not Intended to be Protected,” (IPW, WIPO, 1 December 2016). An updated version of a US paper [pdf] on the Economic Impact of Patent Delays and Uncertainty: US Concerns about Proposals for New Patent Disclosure Requirements, was also resubmitted by the delegation. This morning, the European Union and its member states asked that two proposals that had been tabled by the European Commission on behalf of the EU and its member states at the last session of the IGC be considered again. The first was a proposal [pdf] for the terms of reference for a study on TK, and the second a proposal [pdf] for a study on TCEs. The Central European and Baltic States group concurred and said they supported both proposals. "Traditional Knowledge, Folklore: How To Protect Them From Misappropriation – This Week At WIPO" by Intellectual Property Watch is licensed under a Creative Commons Attribution-NonCommercial-ShareAlike 4.0 International License.